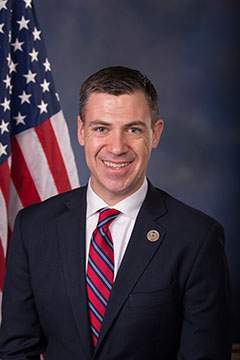 The first bill introduced by freshman Rep. Jim Banks, R-3rd, would require the Department of Homeland Security to review the social media activity of all foreign citizens seeking visas to enter the United States. Banks announced Thursday he is introducing the Visa Investigation and Social Media Act of 2017, or VISA Act, in an attempt the strengthen the vetting process for immigration and travel visa applicants. Homeland Security officials would be required to review all "publicly available social media activity" by visa applicants, such as Twitter messages, Facebook posts and photos, and YouTube videos, Banks said in a statement. Other provisions of his bill would require Homeland Security to interview every visa applicant who is 11 years old or older, conduct a fraud-prevention check of each applicant’s documentation and require that applicants provide an English translation of their documents. The legislation deploy a Homeland Security employee to all visa-issuing embassies and consulates and direct the U.S. Government Accountability Office to review and report to Congress on the visa process 18 months after its enactment, Banks said.